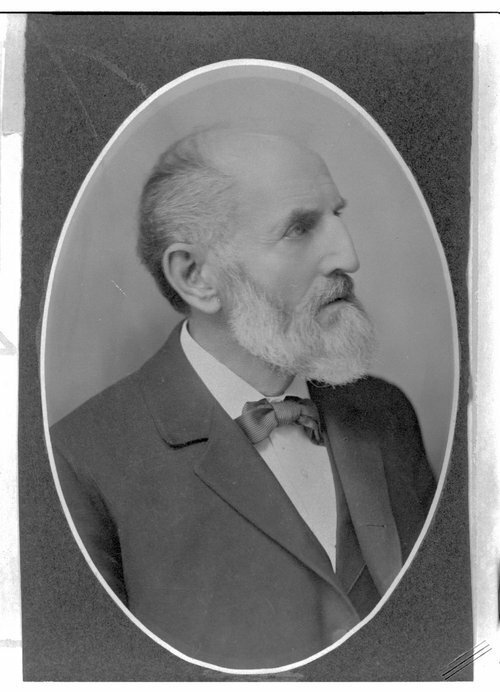 This black and white photograph shows Daniel Read Anthony, (1824-1904), brother of suffragist Susan B. Anthony. He migrated to the Kansas territory in 1854 as a member of the New England Emigrant Aid Company and settled in Leavenworth, Kansas; where he established a long and successfully career as a newspaper editor and publisher. Anthony owned and operated the Leavenworth Conservative, the Bulletin, and later, in 1871, the Leavenworth Times. With the outbreak of the Civil War he left the newspaper business to enlist in the Union army as a lieutenant colonel of the First Kansas Cavalry, later reassigned as the Seventh Kansas Regiment. Anthony was involved in several skirmishes and battles during the Civil War but led troops to victory at the Battle of the Little Blue. In 1862, his military career was marked with controversy for not following orders issued under General Robert Mitchell's command. On September 3, 1862, he resigned from his post and returned to Leavenworth, Kansas. Anthony became actively involved in the community serving several terms on the city council and two terms as mayor of Leavenworth. He was also elected, in 1868, President of the Republican State Convention and served as President of the Kansas Historical Society from 1885 to 1886. For nearly a century Anthony was associated with the issues and concerns of Leavenworth, Kansas. On November 12, 1904, he passed away at the age of eighty in Leavenworth, Kansas.